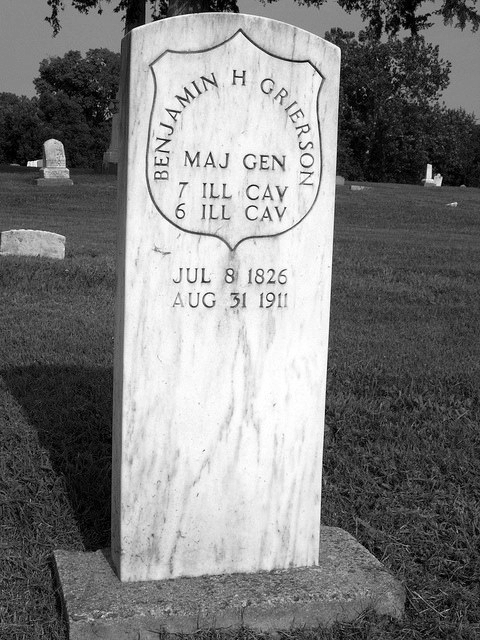 Benjamin Henry Grierson was born July 8, 1826 in Pittsburgh, Pennsylvania. He was the youngest of five siblings. In 1829 the family moved to Youngstown, Ohio where Grierson attended the local schools and showed great promise as a musician. Grierson became afraid of horses when at age eight he was kicked and nearly killed by a horse, after which he hated horses. At the age of thirteen he was named band leader in Youngstown, then in 1850 he began teaching music. In 1851 he moved to Jacksonville, Illinois where he taught music and was the leader of a local band. 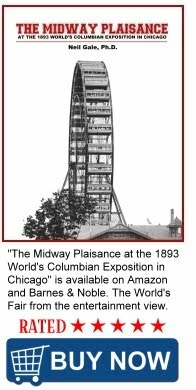 In 1855 he became a partner in a mercantile business in Meredosia, Illinois, a small town on the Illinois River near Jacksonville. He settled in Meredosia and became active in local Republican politics. Although the business can best be characterized as unsuccessful, Grierson managed to support his family. When the war erupted Grierson was still running the business in Meredosia. His military service began on May 8, 1861 as a volunteer aide-de-camp for Benjamin M. Prentiss. 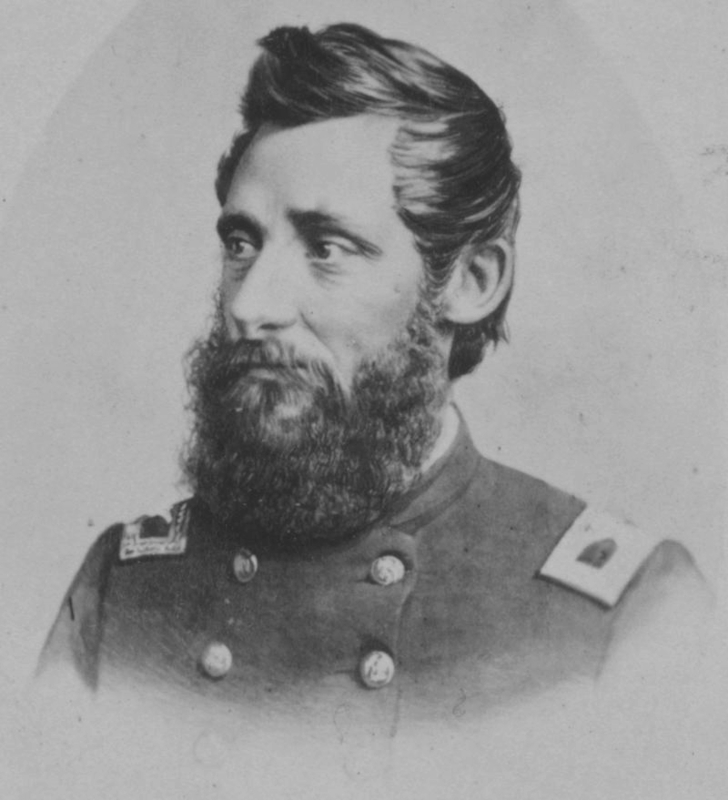 Prentiss commanded troops from Illinois operating in northern Missouri. Grierson served without pay initially with the nominal rank of lieutenant. On October 24, 1861 he joined the 6th Illinois cavalry. The 6th was officially mustered into Federal service on November 19, 1861 with Grierson assigned as a staff officer. He was given the rank of major on January 9, 1862. He was promoted to colonel on March 28, 1862 and given command of the 6th. The 6th operated in west Tennessee and northern Mississippi. Grierson led the pursuit of Earl Van Dorn's forces after they raided the Union supply depot at Holly Springs, Mississippi. 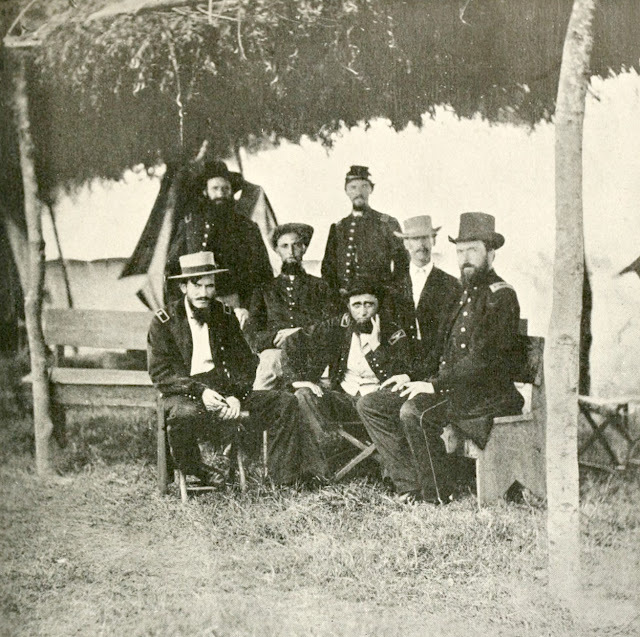 Union Cavalry Colonel Benjamin Grierson (seated with hand resting on chin) and staff. In the spring of 1863, he led Grierson's Raid, a major diversionary thrust deep into the Confederacy, ordered by Grant as part of his Vicksburg Campaign. Grierson departed from La Grange, Tennessee, on April 17, in command of 1,700 men of the 6th and 7th Illinois and the 2nd Iowa Cavalry regiments. Over 17 days, his command marched 800 miles, repeatedly engaged the Confederates, disabled two railroads, captured many prisoners and horses, and destroyed vast amounts of property, finally ending in Baton Rouge on May 2nd. He was rewarded on June 3, 1863 with promotion to brigadier general. Union Troops under the command of Colonel Benjamin Grierson at Camp Baton Rouge, May 1863. He was given command of a division and the cavalry of the Army of the Mississippi. In December 1864 and January 1865 he led raids against John B. Hood's communications resulting in the capture of Verona and Egypt Station, Mississippi for which Grierson was brevetted major general of volunteers. He led expeditions from Mobile, Alabama into Georgia and Mississippi. 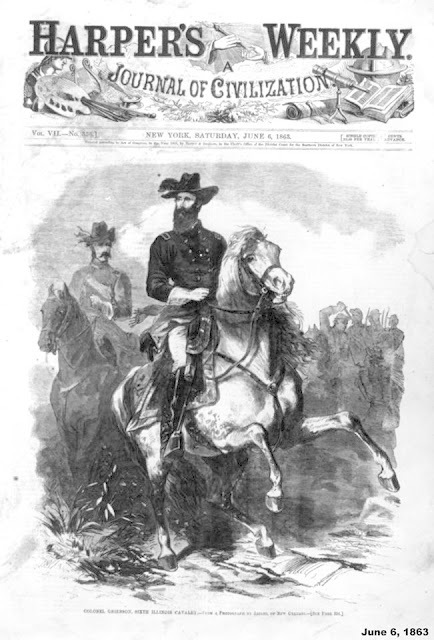 He was promoted to major general of volunteers in May 1865. Following the war Grierson remained in the army with the rank of Colonel. He organized and was the first commander of the 10th US cavalry, one of the two cavalry units of black enlisted men with white officers that became known as Buffalo soldiers. He was brevetted brigadier general and major general in the regular army on 2 March 1867. He commanded Fort Riley, Kansas and Fort Gibson, Oklahoma from 1867 until 1869, heading the District of the Indian Territory from 1868 until 1869. After selecting the site for Fort Sill, Oklahoma in 1869 he supervised the construction and commanded the post until 1872. He then spent two years supervising recruiting efforts in St. Louis, Missouri. In the spring of 1875 he was sent to Fort Concho, Texas. He commanded the District of the Pecos from 1878 until 1880 during which period he is credited with opening West Texas to settlement and the railroads. 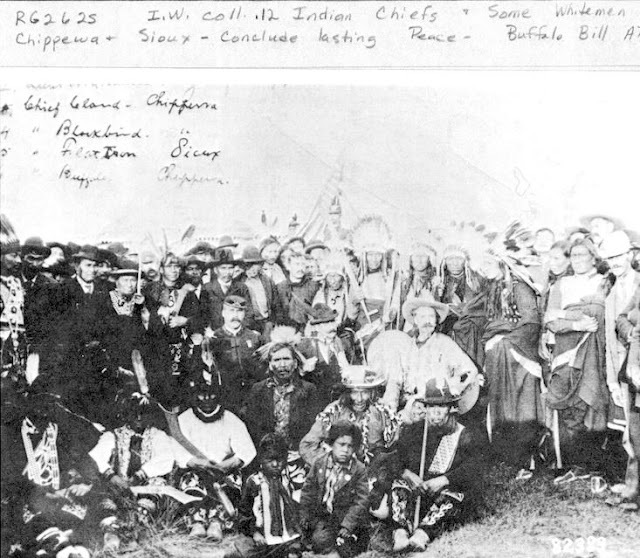 Colonel Benjamin Grierson and Buffalo Bill with Chippewa and Souix Indians. In 1882 he shifted his command to Fort Davis, Texas where he invested in real estate and organized a company to promote railroads. He established a huge ranch near Fort Concho where he was planning to retire. In 1885 he was transferred to Arizona where he commanded Whipple Barracks then Fort Grant. He was commander of the District of New Mexico from 1886 until 1888. In November 1888 he assumed command of the Department of Arizona. He was promoted to brigadier general on April 5, 1890 becoming one of the few civilians, no formal military training, to reach the rank. He retired on July 8, 1890. He returned to Jacksonville, Illinois but made frequent trips to his ranch near Fort Concho. In 1807 he had a stroke from which he never completely recovered. He died August 31, 1911 at his summer home in Omena, Michigan. Grierson is buried at the Jacksonville East Cemetery, Morgan County, Illinois.